A major Air Show in the heart of the Flower Riviera – don’t miss the chance to see the incredible ‘Frecce Tricolori’ show, and watch their fantastic aerial acrobatics over the most beautiful seascape in Italy. You should take advantage of this event to have a short holiday! 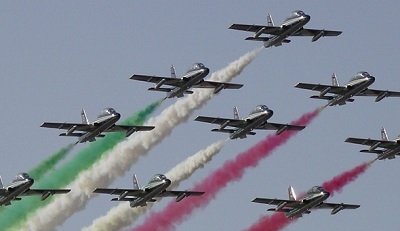 Watching the Frecce Tricolori event in Liguria will leave you with your mouth open in amazement! And Nyala Wonder Travel have arranged a tourist itinerary that is full of surprises. Arriving in the Riviera on late Saturday morning, we’ll show you a typical restaurant where you can enjoy a tasty lunch and get your holiday off to a good start; around 2:00 pm the show will begin – it is guaranteed to leave you breathless with your eyes glued to the sky. The latter part of the afternoon will be free for some shopping in the city, then back to the hotel for dinner and a free evening when you might like to try your luck at the Municipal Casino of San Remo. In the morning, after a hearty breakfast, we recommend that you visit Dolceacqua and its ancient castle that still overlooks the town; you can stroll among the « carrugi » (San Remo dialect for narrow streets) of the ancient town under the shadows of its picturesque ruins. For lunch we have decided to take you on a trip to sample all the flavors of Liguria, with a tasting of local specialties. At the end of the visit, return to place of origin. Accommodation in double room in a 4 star hotel, half board included. Tasting of wines and typical dishes. A voucher of coupons for the Casino of San Remo. Lunches and dinners must be selected according to the menu of the day or the tasting menu offered by the chef. Beverages and à la carte snacks must be paid on site. The visits suggested in the program are to be considered free, i.e. without a guide.